Built to empower the modern investor. 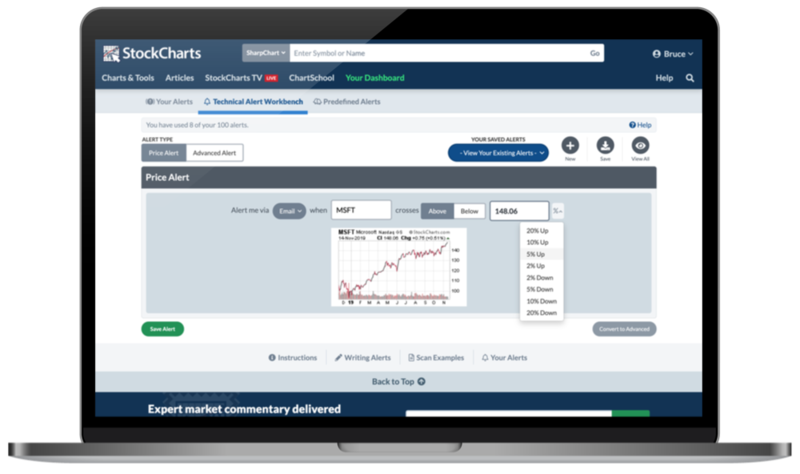 Whether you're watching the broader markets or tracking an individual stock, our unique range of charting tools and analysis resources will give you the edge you need to stay ahead of the curve. Monitor and analyze your portfolios like never before by saving and organizing the charts you're watching in custom ChartLists. Plus, access everything from all your devices to make managing your investments a breeze. Find promising new trading or investment opportunities faster than ever before with our scanning and alert features. Scan thousands of symbols in seconds to find stocks and funds that fit your specific technical criteria. Create larger, more advanced charts with real-time intraday data, more indicators and overlays, auto refresh and much more. Save your charts, settings and annotations, create and organize ChartLists to make managing your portfolio a breeze, and access everything from your desktop, laptop, smartphone or tablet. 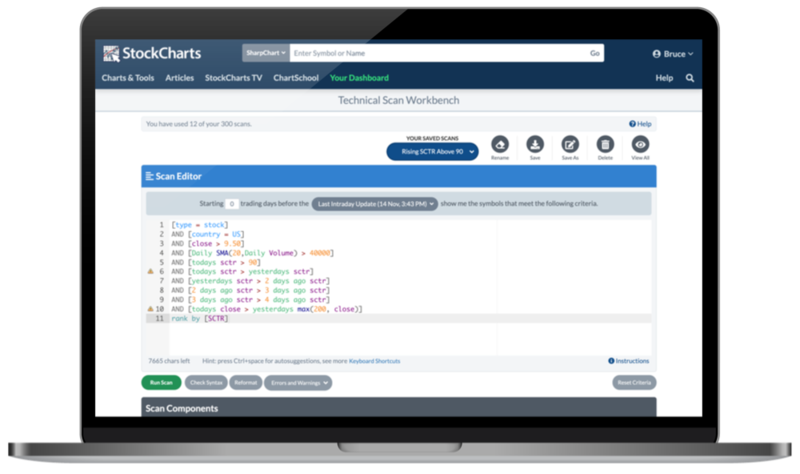 Save and organize the charts you're watching with custom ChartLists. 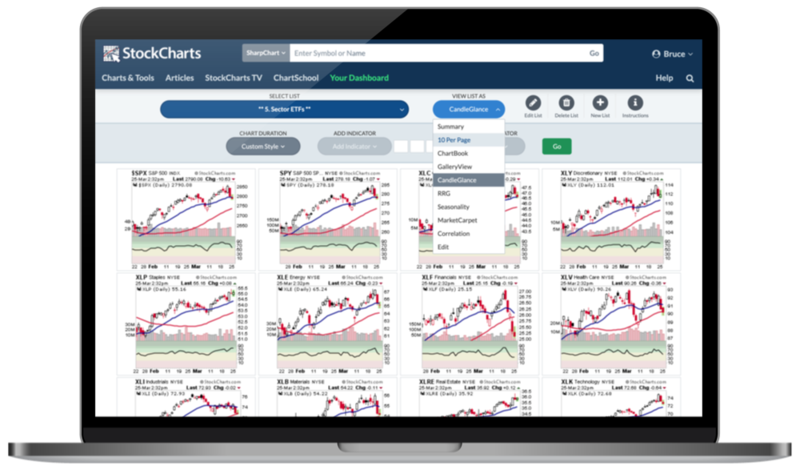 View your charts in a variety of formats, including Summary view with latest performance data, 10 per Page with your own custom ChartStyles, ChartBook, CandleGlance, GalleryView and many more. 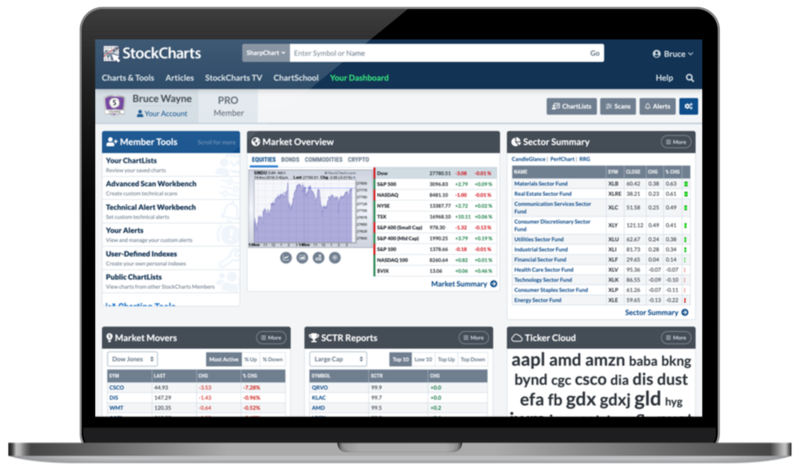 With everthing saved to your StockCharts account, you can access your charts anywhere, anytime, from any device. 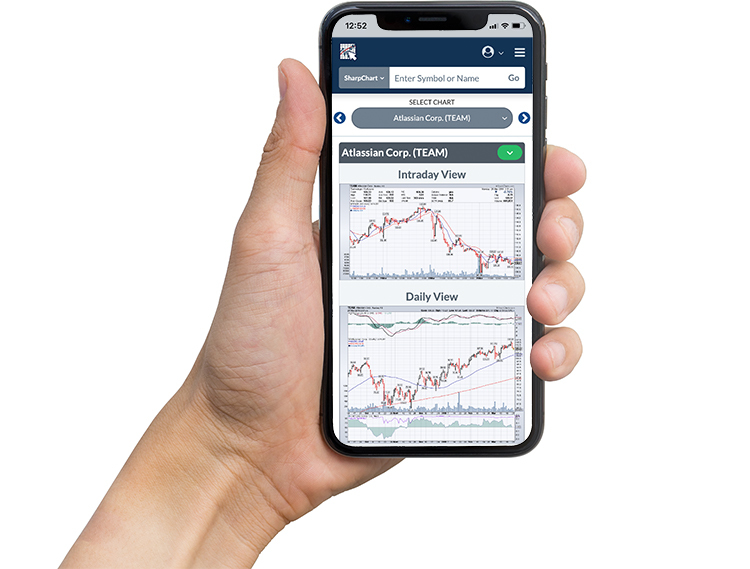 The heart and soul of your StockCharts account, the Members Dashboard features a customizable layout that can be tailored to fit your needs. 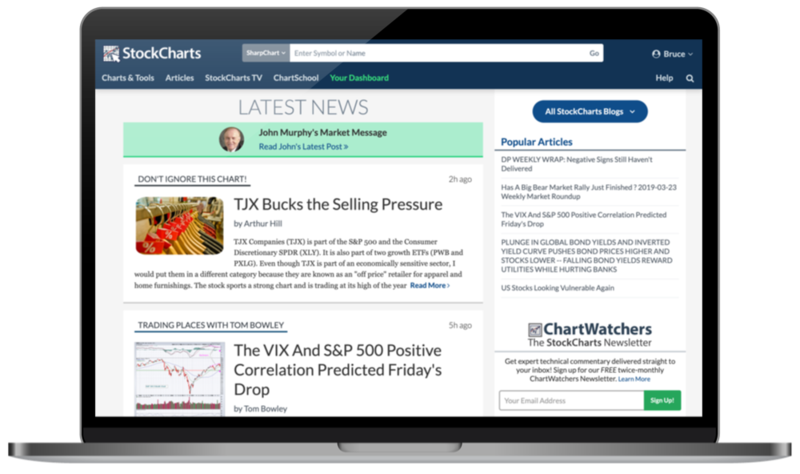 Follow the day's market movers, stay on top of your portfolio with quick access to your ChartLists, and run your custom scans in a single click. Instantly find stocks and funds that meet your specific technical criteria with our custom scanning tools. Run your scans on over 50,000 symbols in our database to help streamline your investing workflow and discover new, promising opportunities. Create custom technical alerts and stay ahead of important moves with email, SMS and web notifications. Whether it's a simple price cross or an advanced combination of indicator triggers, our alert features will make sure you never miss a thing. Unlock market commentary from industry experts, such as John Murphy, Martin Pring and Arthur Hill. See the markets through their eyes and follow exactly what they're seeing on the charts. The web's best collection of technical tools and resources, all at your fingertips.